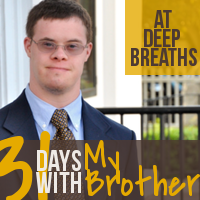 Each day this month I will be writing about my brother, Brian, who has Down Syndrome, by linking up with The Nester. I am excited to share my brother with you and hopefully inspire you to live life to the fullest; the good, hard, and everything in between. I am delighted to have my parents and sisters share too as we tell why we love this swell guy. Having a brother with special needs inspired me to get a degree in special education—I taught for four years before my husband and I started having children. This series is not heady, it’s from the heart—the place from which my brother lives. Brian has taught me a lot about life, loving and embracing the unexpected. It is a gift to be able to share some of those things with you during this 31 Day Series.